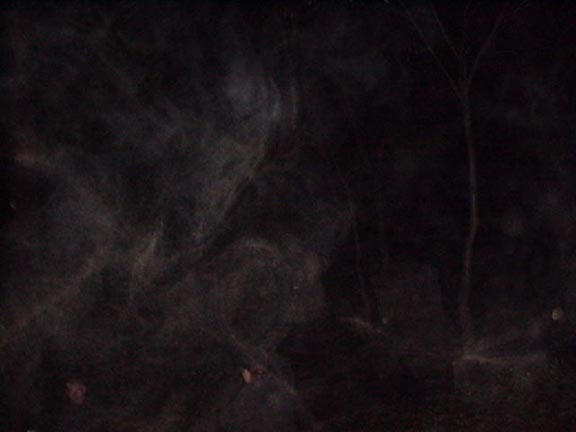 I would like to share a photograph that a friend of mine-- Henry Pena took at the infamous Bachelors Grove Cemetery in Midlothian, IL in July of 2001. He arrived around 2am, it was a very clear and peaceful summer night. There was no one else in the cemetery on this very quiet night. After being there for about an hour, he suddenly heard noises moving throughout the cemetery. It sounded like someone saying, "SSSHHHHHHH." The noises stopped. Around ten minutes later, it started again, this time about a foot behind him. He immediately turned around and started to take pictures. He was not detecting any spikes with his EMF detector or thermal-scanner. This is what he was able to capture. It appears to be a side profile of an ectoplasmic figure of a woman. However, even more amazing is the small red face in the bottom left hand side of the photograph. It appears to be that of the devil or a demon. You can make out two yellow eyes, a nose, an ear, a mouth, and what looks like a horn.